“There’s something very important that I don’t understand. How can I be a woman and still be happy?” Anna O. is a thirtyish New Yorker living in the squalid East Village of 1990. Dead friends and junkies on the sidewalk are a fact of life, and worsening political unrest is threatening to destroy the world as she knows it. Plus, she’s always falling for the wrong women. She needs help, and she finds it — or does she? — in the person of Doc, a street-corner therapist who charges $10 and only sees each of his patients three times because “I get what I need out of it by the third session and you can too.” Doc diagnoses Anna with empathy, but it seems like her problems might be more complicated. Such as: does she exist? Does Doc? Do you? 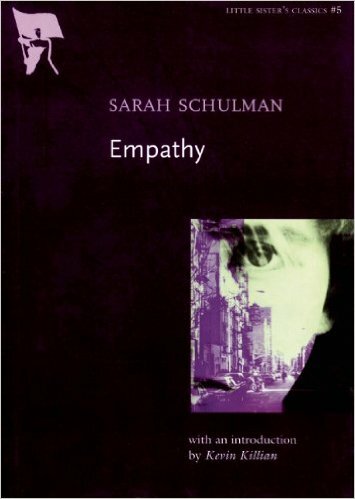 Funny, deep, profoundly disturbing and almost impossible to accurately describe, Empathy is one of the most exhilarating novels we’ve ever read. At the time of its initial publication (1993), the L.A. Times called Sarah Schulman “the master of a gorgeous simplicity that is resilient enough to encompass everything from recipes for Three Musketeers Treasure Puffs to lyrical passages and intimate bedroom chatter.” In addition to recipes, this novel contains plays and even, sort of, poetry. But it never strays from the colloquial, comprehensible patter of everyday life, which its readers might never look at quite the same way again. 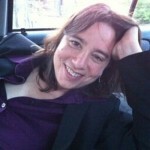 Sarah Schulman is the author of seventeen books, which include both nonfiction books, plays, movies and novels, including The Gentrification of the Mind, After Delores and Rat Bohemia. Her new books are a novel The Cosmopolitans and a nonfiction book Conflict Is Not Abuse: Overstating Harm, Community Responsibility and the Duty of Repair. My girlfriend while I was writing this book (who I met on the subway), Debby Karpel, a singer, was the lovely office temp whose co-worker complained to her about a gay man sitting too close to him. “How would you like it if some butchy woman was in your face all night long?” Anna O.’s femininity was partially hers. "The wind smelled clean, like clean magazines. It smelled like invisible ink."